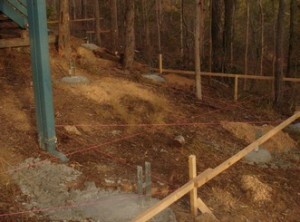 How a deck will come together is determined even before the first hole is dug. When you start to measure out your deck, you need to ensure that all your measurements are taken level. I know this may seem obvious, but doing this on a steep site like the one in the photo is not always easy. Looking at the photo, you may have noticed that the profiles (the temporary timber frames that the string lines are tied to) have different level steps in them. When the profiles have steps in them you are able to transfer measurements between the different steps, while at the same time keeping all the measurements level. Also the stepping process keeps all the profiles at a comfortable working height and makes it much easier to install your footings later on. For more information on setting out your deck you can purchase our own copy of our “Site preparation and deck set out” guide from the Resource Shop. What to consider when planning a deck for your spa. 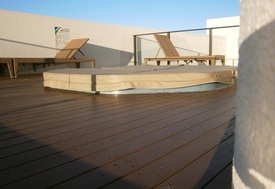 There a few considerations when looking at building a deck around a spa. However in this article we are going to look at the longevity of the deck. This is a critical point that needs to be addressed during the planning stage, because timber decks and chlorinated water do not mix very well. This is especially true with spas due to their nature, spas contain warm to hot water. There are two things that happen. First, warm water, when splashed, soaks into the timber quicker than cold water. This chemically rich water increases the speed of the timber deterioration compared to a deck exposed to the normal weather conditions. To overcome this you need to allow for a stronger, more durable deck coating product. Secondly, as the timber draws in the water, the fixings (nails, screws, etc.) that hold the deck together become exposed to all the chemicals in the water and start to corrode at a much faster rate than normal. To avoid this and slow down the corrosion on the fixings, consider using stainless steel fixings. When you are planning a deck for your spa, make sure you take into consideration the added effects of the water on your deck. Raised decking nails, what’s the verdict? There is nothing worse than walking out onto your deck barefoot and stepping on a raised nail. There are many reasons why nails lift, such as the age of the deck, an incorrect nailing pattern, or even over cleaning of the deck; however the root cause of the problem starts right back at the construction stage of the deck. It can start with something as simple as using an incorrect nailing pattern (bear in mind this is not the only cause, just the most common). 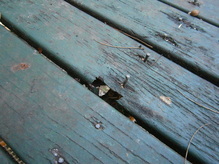 As you can see from the photo the nails have all been nailed in a straight line and this has sealed the fate of the deck. When decking boards are nailed in a straight line the nails act like a series of tiny wedges splitting the floor joist along its length. Over time this splitting of the floor joist is amplified by continuously wetting the deck, either by over cleaning (hosing) or weathering due to age. As the splitting gets deeper the nails are no longer held down by the floor joist and they eventually come free, rising up. When the nails start to lift it is time to make a very serious check all over the deck, including in between the decking boards, to see if the floor joists have started to split. Best practise to avoid this problem is to stagger the nails rather than nail them in a straight line. This process is outlined in our “Installing Decking Boards” guide. For further reading, check out our “Articles” section. When stair maintenance is no longer an option. It is all too common for people to ignore stair maintenance, especially when considering timber stairs. You may be surprised to know that timber stairs require more care and maintenance than decks do. Stairs have lots of different check outs (grooves for the step treads) in the stringers (stringers are the timber beams that support the step treads) and posts where water can get into the timber. When water gets into the timber it creates the perfect conditions for dry rot, which is the most common form of timber rot. In the photo you can see the bottom step tread has been replaced, but the timber stringer has not been replaced. It is clear that because of the dry rot there is no solid timber left around the stringer to support the step tread. 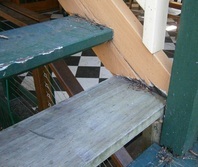 To overcome this problem, a piece of timber has been screwed to the stringer to support the new step tread – this is a very dangerous practise. If additional timber needs to be added to the stringers to support the new step treads, the structural integrity of the stairs has been compromised and the stringer/s need to be replaced. This photo is a good illustration of a set of stairs where maintenance is no longer an option. Do you have any maintenance questions about your own deck? Send us an email and we will answer any questions that you have ([email protected]). The difference between rusted and gal bolts. Your first question may well be, “What is gal?” Gal is short for galvanising, and galvanising is the protective coating that stops steel from rusting. The most common coating that is used is zinc; zinc is a metal that is more reactive than steel and because of this the zinc rusts/corrodes before the steel does. When it comes to your deck, it is fairly obvious that we will want to use galvanised bolts, due to the fact that decks are external constructions, which are exposed to the elements. Not only do your bolts have to withstand the weather, they also need to tolerate any cleaning that occurs over the lifespan of the deck. 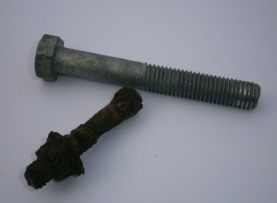 How do you tell the difference between a galvanised and a non-galvanised bolt? Galvanised bolts have a dull grey look about them, as you can see in the photo. A trap that you will need to look out for when purchasing your bolts is that a lot of ““bright” bolts (bolts that have a shiny metal finish) are marketed as being zinc coated, which they are. However the zinc coating used is so thin that it offers no protection against rusting. When buying or placing your order for bolts, always insist on galvanised bolts rather than zinc-coated bolts and this should avoid the problem. If you would like to learn more about deck building, check out our other great articles in the “Articles” section.